This post originally appeared on the International Monetary Fund’s Public Finance Management Blog on 4 September, 2018. Climate change is arguably the world’s greatest development challenge—and it will also be one of the most significant public finance challenges countries will face for decades to come. The estimated cost of moving to a low-carbon, climate-resilient world is upwards of hundreds of billions of dollars a year. While governments will shoulder a share of these costs, they will also need to effectively leverage private sector capital to cover much of the bill. The significant role of private sector finance in the response to climate change includes investing directly in low-carbon markets like renewable energy, developing climate-relevant projects in countries, and providing debt finance for governments to pursue low-emission, sustainable development. Now, a recent study from the UN Environmental Program (UNEP) warns that the poor countries that are most vulnerable to climate change will pay more to borrow because of that vulnerability. Climate change is hitting developing countries hardest because of both their geographical location and their limited capacity to respond. Avoiding potentially devastating loss of lives and blows to critical economic sectors requires urgent action, but these countries already struggle to meet their people’s needs and grow their economies. It’s a double whammy—first, climate-vulnerable countries must spend more to address the impacts of global warming, and second it raises the cost of doing so. Climate-vulnerable countries will respond by using a combination of foreign assistance and domestic revenues, such as taxes. This mix often won’t cover the bill, so those governments that have access to international credit markets will likely seek to borrow the money needed to fill the gap. But climate change-induced economic and political instability can increase the risk of default, especially in developing countries, so investors will demand higher interest rates to offset this risk. The UNEP study, conducted by the Imperial College Business School and SOAS University of London, finds that climate-vulnerable countries will pay an extra $1 of interest for every $10 because of this vulnerability. Over the past decade, this additional interest amounted to an estimated $40 billion—money that could have been spent to build climate resilience, grow key economic sectors, educate children, or provide critical services to move people out of poverty. Defusing this threat to the development of climate-vulnerable countries will require action at both the country and international levels. The UNEP study argued that the best way for climate-vulnerable countries to minimize higher borrowing costs is to reduce their climate change risk. To do so, governments will have to invest public resources effectively into actions to mitigate climate change and adapt to its impacts. An additional benefit from reducing climate risk is that it will make countries more attractive to other forms of private finance. Evidence from around the world shows that governments are more likely to make and effectively implement better policy choices, including those related to climate action, when informed and engaged citizens and civil society organizations (CSOs) influence budget decisions and monitor spending on the ground. To foster such accountability, governments must provide full information about how they raise and spend public money and open their budget processes to the public—and citizens and their organizations need to get involved. Take Nepal, for example. Climate change threatens this country’s main economic sector and its food security. Last year, Freedom Forum, a local CSO, used publicly available information to track funds for an irrigation scheme intended to help farmers adapt to drier conditions. The good news—they found that the funds were reaching farmers and increasing production. But they also identified problems in how funds were distributed, which the government needs to resolve to improve and effectively expand the program. At a minimum, the tracking generated useful information that could ultimately lead to a more climate-resilient agricultural sector. It is now up to the government to act on the information, and for Freedom Forum and others to use it to keep the pressure on. Opening budgets also can have an independent effect on government borrowing costs. In a 2012 analysis the International Monetary Fund found that fiscal transparency can lead to improved credibility and performance. The International Budget Partnership’s (IBP) Open Budget Survey 2017, which covered 115 countries in its global assessment of budget transparency, participation and oversight, unfortunately finds that most of the climate-vulnerable countries in the UNEP study have weak budget systems—some amongst the weakest in the world. But taking on both systemic governance reform and effective climate action—and footing the bill—are huge asks for these countries, especially as they have little to do with causing climate change. 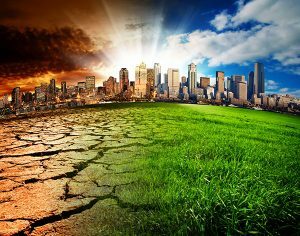 Developed countries, whose carbon-fueled growth and consumption drives global warming, have recognized their responsibility to provide financial and other support to developing countries for climate action. They have made a collective commitment to provide $100 billion a year in climate finance by 2020, which is enshrined in the Paris Climate Agreement. It is imperative for industrialized countries to fulfill this commitment, to reduce both developing countries’ climate vulnerability and their need to borrow. Donors and other international actors must also provide capacity-building and other support to governments to improve how they manage public resources for building low-carbon, resilient societies, as well as to domestic CSOs to enable them to play effective accountability roles. For instance, in the Nepal case, in addition to working with the government on improving its budgeting, the UN Development Program supported the Freedom Forum’s budget-tracking initiative. Similarly, IBP has long provided support to governments and its civil society research partners in understanding and improving budget accountability through the Open Budget Survey. This isn’t just about reducing borrowing costs for poor countries or increasing private sector investment. Effective government action on climate change is essential to creating an equitable and sustainable world. Given that inadequate, poorly designed, or poorly implemented investments could squander these opportunities, everyone needs to take up the challenge.